Life gets pretty interesting with all the responsibilities and commitments I have. I am always spinning a lot of plates, so to speak, and this time of year it is important that I stay on top of everything. When commitments pile up, I know it is time to get everything down on paper. Then it’s time to do some editing. I highly recommend you try this out, too. Edit commitments in your life. Work – don’t only write your job; write down all the commitments you have at the job. Side hustles – I have a ton of side hustles. More commitments. Family – our roles as family members obviously come with many commitments. Kids – I have two kids. Homework, baseball, dance, piano. Each of their commitments is mine and my wife’s, too. Civic – you might be a board member or officer on a non-profit organization, or a community volunteer. Religious – some of us are very involved with, or are part of a religious organization. Or perhaps we are committed to going to service once a week. Hobbies – perhaps you are a runner or a cyclist, or you collect things, or you have a rock band that plays gigs on weekends. Home – we all have chores and jobs that come with home ownership. Online – you may be part of a Google group, and online forum, or…you may write a blog! All more commitments. I am sure you have other categories. List everything. I am at a point in my life where the time I spend on my commitments must give my life value. Take a close look at your list and consider if that is the case. Ask yourself: How important is each commitment to me? How would it affect my life if I dropped out? Is it in line with my life goals? At least one thing must be crossed off. It is always hard to completely cut something out of our life that has been a commitment. I know it is tough, but if you cut one thing out, at least for a couple weeks, you may find that you happily get along without it. Making a pledge to not take on any new commitments is also just as powerful. I always feel a bit guilty when I cut out a commitment, because others probably wanted me to keep it. The feeling of relief, however, is more powerful than the guilt most of the time. If we committed to what everyone else wanted all the time, we would never have any time left for ourselves. 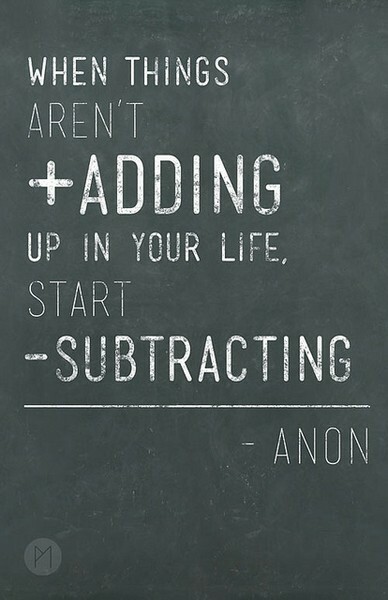 Subtract so you can add. Sometimes in life we need to subtract people, events, and things so that we can make room for someone or thing (a job, a new hobby, etc) to enter our lives which has the potential to enhance it to the extreme. And even though we may not know what it is, we must begin to trust what our life is telling us. Take the time to write and edit your commitments, and your life will be greatly simplified. Try it!